The huge increase in ease of self-publishing- and decrease in cost- has led to a shift, not just in the way books are read and sold, but in the way they are discovered, marketed and promoted. Gone are the days where a select few reviews in periodicals had the power to make a book (although those entities still exist and have power), replaced by a multitude of sites such as this one, and GoodReads, where readers exert tremendous cumulative influence via their own ratings, reviews and promotion. This, for the record, is a good thing- mostly. It is, of course, open to abuse, but so were the old systems. Many people have no rating system between five stars and one, and will give a two-star review because their devise froze up while they were reading a given book. In the aggregate, though, it's a good thing to see the audience at large being able to sound off on and share books easily. Which leads to that list to the right, which has made the rounds a couple times in the past months. Some authors love it (most notably those who aren't particularly noteworthy) while others decry it. If you want to do the rest of the things on that list, I will appreciate it. A lot. Because it will likely lead to more sales, which in turn lead to me writing more, which in turn means I hopefully will be able to write more for you to enjoy. Now, you might not enjoy my book. That's your right, as it would be your right to give it a horrid rating and review. 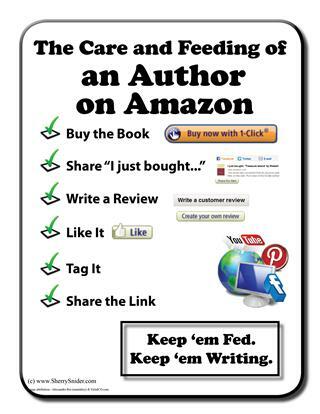 But all I can ask, as an author, is for you to enjoy my book. However, the people who really benefit from you rating and reviewing it (honestly) is the community at large. With the proliferation of indie works out there of varying quality, reader reviews will serve to guide others to quality work and make that stand out from the static. 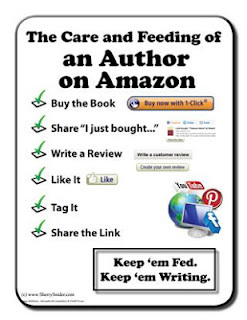 It's about more than the care and feeding of an author, but about the literary community as a whole- authors and readers. If you've been reading this column for a while, a while back I interviewed SC Harrison, who had a pretty rad fantasy novel out. Well, she's grown up into horror and her first horror release, Planks comes out next month. I will have a review shortly, but holy cow you guys it's so good. So stay tuned for that. It's already way over-funded, but there is a Kickstarter for The Very Hungry Cthulupillar which I can confidentiality say is the greatest thing ever. Rolling with Kickstarter, Walk the Fire is a promising SciFi anthology with just a few days and several bucks to go. Moving across the pond, SciFind is launching a monthly short SF/F/H magazine, or attempting to, and there will be a story from yours truly in it if it gets funded. So not only do you get really good fiction, you get to support my alcoholism writing career. One last bit of blatant self-promotion, but I have a few bookmarks to give away. I'll be doing a new run before too long, with different art, so if you want the really early stuff, this is pretty much the last chance to get it.